Anyone with an interest to own a firearm and is a citizen of Massachusetts can go ahead and submit an application for the same. There are also special provisions for the non-residents. However, you ought to understand that you will not automatically qualify for the FID card Boston. There are steps you have to take and requirements you have to satisfy. The purpose of this post is to help you know what you need to do. According to the Massachusetts gun laws, every person applying for a gun license must first complete a certified gun safety course. These courses are offered by both the local police departments and private companies. The range of courses covered will depend on where you choose to complete the course. Private companies tend to cover more units whereas the courses being offered by the local police departments only cover the basic units. A typical gun safety course in Boston will only last a few hours. You will be educated on the gun laws, how to care and handle a firearm and also spend time on the firing range. Upon the successful completion of the course, you will be issued with a gun safety certificate. The certificate has to be attached to your application for an FID card Boston. Be over the age of 15 but under the age of 21. Applicants under the age of 18 must have parental permission in order to qualify for the FID card. In the case of drug abuse and mental health, there is still hope if you can get a signed affidavit from your attending doctor that states the condition no longer affects you. If you don’t have a good criminal record, you might want to work with an attorney to evaluate your options. 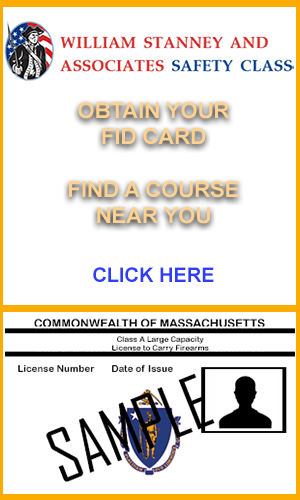 The gun licensing authority in the Commonwealth of Massachusetts is the local police department. You will need to visit the Boston police department near you to get the application forms. The completed forms should be submitted to the local police department in person. An additional interview might be required and your fingerprints will be taken. He chief of police reserves the right to issue or deny you the FID card Boston. After submitting your application, the local police department will send your fingerprints to the Colonel of the state police within 7 days of the application. The colonel will respond within 30 days. The FID card will not be issued until the colonel’s office Okays it. If your application is denied, you can appeal it within 90 days in the district court.